I think I might be in the market for a larger than my current 4 1/2" angle grinder. I would be using it mostly with a cut-off wheel. Anyone have any luck with Harbor Freight 7-9" grinders? I use the chit out of my HF 4 1/2" grinders. If they go bad, pitch it, go spend $20 for a new one. I'm also considering a Milwaukee unit. I have a number of Milwaukee electric tools. I'm basically trying to pick between a Milwaukee unit or Harbor Freight unit.. Any thoughts? I have a 7" Milwaukee side grinder with the soft start.....kickass grinder. No where near as violent as the old school B&D I have of my dads. It's dubed the "man killer". 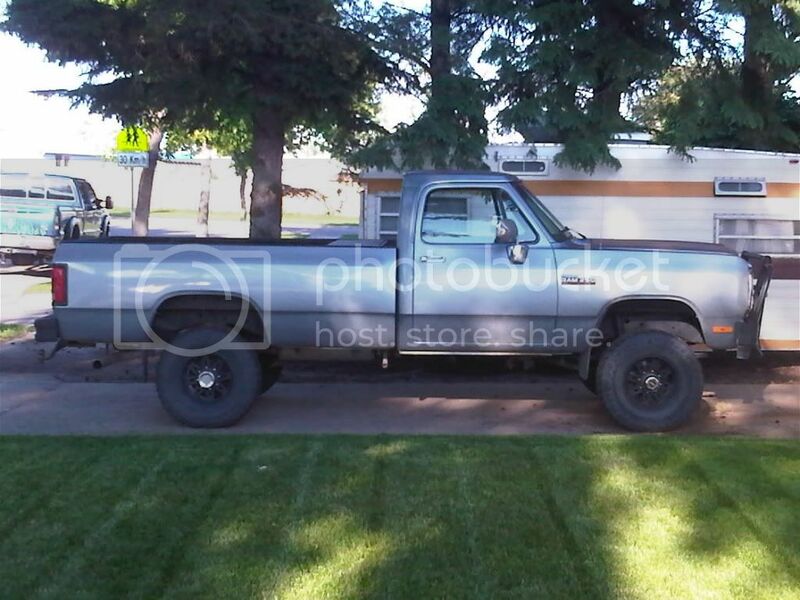 I've actually rode that B&D grinder inside a truck bed with a cup brush attached. I don't know if I'd want to use either one with a cut off wheel tho. What about a chop saw? Well, I'm working on a 3' square of 1" plate that I'm trying to cut up into ~7"x16" blocks to use as press plates on my new 50 ton press. I made one 3' cut last night, took 2 hours, smoked 1 HF 4.5" grinder, went through about 5 cut off wheels. I was hoping a larger angle grinder would be the trick? I have a cutting torch, but I really want more of a machine cut look.. If you buy newer stuff then you can probably handle them. The ones with the "soft start up" have some sort of computer chip governor thing in them (I've been told this,there for its hear say). Look into a Metabo....they take a big blade and are only for what your trying to do. Oh and harbor freight sells those plates.....you might have to order them,but they do sell them. I have put my Makita 4" and 4.5" grinders through hell and back. Worth the $55-$100 to get one. My 4.5" lasted 7 years of cutoff duty from siding to 1" thick steel. Finally died when the armature burnt up. 1 set of brushes. I expect this 4" I bought to last half as long. It is doing well for the last year I have had it. I think I'd use the torch, go slow, and clean up with the grinder. But that's just my opinion. 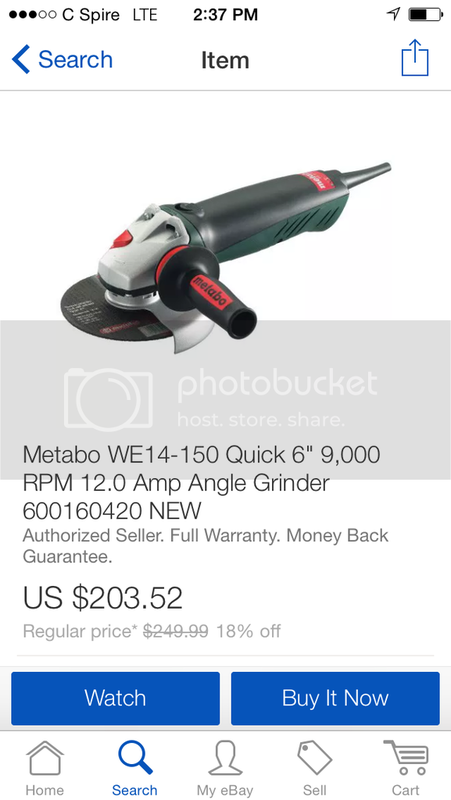 Those Metabo grinders are tough SOBs. We have a 4.5 inch one at work that was there when I got there 16 years ago and is still going strong. It gets abused because everybody grabs it to grind stuff they should be grinding with the 7" unit. A lot of money but it's a great case of "you get what you pay for!" ellis93 wrote: Oh and harbor freight sells those plates.....you might have to order them,but they do sell them. Not for one this big! The bed is 10" ID. Then 3" on either side. My HF 20 ton unit has 8"x8"x1" cast plates. This 3 foot square 1" plate came with the press, so I'm going to try and put it to use. I'm sure by the time I get down to the last couple pieces, I'll use the torch. We also have a Metabo at work, we used to sell them too. Well, I should say we used to stock them. Nobody bought them lol. I've searched online and most of the bigger grinders say they have the 'soft start'. Think I'm going to get a 6" Milwaukee angle grinder. Thanks. Dad borrowed a metabo from work before he retired. Im pretty sure he loves it more than he loves me. Its a really nice tool. Torch, plasma cutter or water jet. Well apparently free shipping from Northern Tool means your item won't even ship for at least a week, then take another week to arrive . So while waiting, I took Pete's advise, got the cutting torch out and started cutting a small section. Turns out if you take your time, you can make some decent cuts. I was surprised. Then a few minutes with a 40 grit flap wheel cleaned up the cut. I'll be doing the rest of the plate with the torch now lol. Might just send Northern their 6" angle grinder back? See? Us old guys DO know how to do more than drink beer and BS.